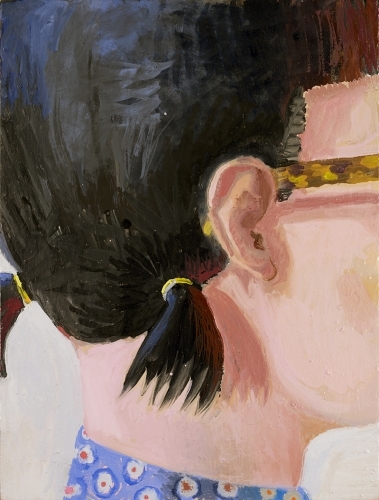 The painter’s buoyant portraits of female artists both real (herself) and imagined are hard to resist, although self-conscious nods to modern masters provide more sandbags then helium. (Picasso appears in the form of several postcards pinned to studio walls, a pictures-within-pictures motif that also recalls Matisse’s “Red Studio.”) Also charming are close-cropped views of outfits that double as deft studies in pattern-and-decoration abstraction. In one, a dotted blue jacket, fastened with looping black frogs, plays neat tricks with negative space, as two triangles—the empty space between hands on hips and bent elbows—rhyme with the pointed ends of a collar. Through May 25.